The Colonnades, is a complete departure from the typical dining hall or food court. Designed by Spillman Farmer Architects, The Colonnades is a two-story, 24,000-square-foot dining facility that offers a variety of separate and unique dining choices instead of one large room and kitchen/servery. The result is a building that transforms the very concept of a dining hall and offers an exciting variety of spaces and experiences for students. 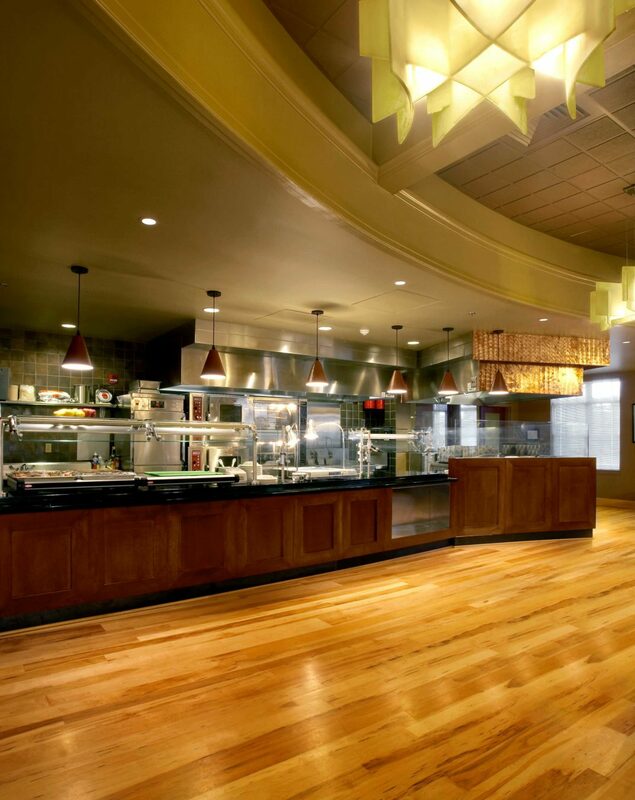 In 2007, when Elon University opened the doors of its first new dining facility since 1968, it set a new standard in campus dining. The University’s goal was to offer locally grown produce, high-end dining atmospheres, and an environmentally sustainable building. The new facility, called The Colonnades, is a complete departure from the typical dining hall or food court. Designed by Spillman Farmer Architects, The Colonnades is a two-story, 24,000-square-foot dining facility that offers a variety of separate and unique dining choices instead of one large room and kitchen/servery. The result is a building that transforms the very concept of a dining hall and offers an exciting variety of spaces and experiences for students. The first floor of the building features The Fountain Market, a grocery mart where organic and locally grown products are sold. Within the Market are the deli and fresh-tossed salad venues. Also on this level are the food service provider’s campus offices and the central cooking kitchen. A grand staircase leads visitors to the upper floor, where four separate dining venues are located. Diners can choose from among a full-service restaurant serving steaks and seafood, a brick oven pizza for Italian-style fare, a soup and sandwich stop, and an international cuisine venue with food prepared on a Mongolian grille. Connected by a central arcade, each venue boasts a distinct identity and unique ambiance. There’s also an outdoor terrace overlooking the campus for open-air dining during the warmer months of the year. The Colonnades was re-dedicated in 2017 and renamed Clohan Hall, in honor of the Clohan family, who made a generous donation to the University.